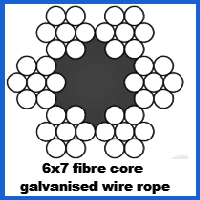 Choose our 6mm galvanised wire rope with this 6×7 strand configuration if you need a thin, fairly flexible product which is still capable of providing adequate strength and resilience for a number of taxing outdoor applications. The capacity and sturdiness of this wire rope is determined by the type of steel used in its construction. Loads which tip the scales at almost 2.4 tonnes can be shouldered by the highest quality example, but there are other options on offer so you need to take time to select carefully. The steel surface of all 6mm 6×7 ropes we make is protected through the process of galvanisation, which means that corrosion should not take hold and this rope will perform admirably in marine environments and a range of other adverse conditions. However you plan to use your 6mm 6×7 Galvanised Wire Rope, you can rely on Rope Services Direct to provide a comprehensive manufacturing solution. We can construct tailor made assemblies using the materials you specify, or ship out lengths of rope with the equipment needed to crimp, cut, coil and adapt the product yourself. Galvanised rope like this is just a minor part of what we can produce; our range also includes stainless steel rope, fibre rope and everything in between. You can ask about galvanised rope, get a quote or order with RSD when you call 01384 78004 or send an email to our experts. Our advice is always delivered in a friendly, informative way, no matter your experience level. 6mm 6x7 Galvanised Wire Rope Overall rating: 5 out of 5 based on 6 reviews.